The end of each month brings with it a sense of excitement as we discover what games are coming free to Xbox Live Gold members with the Games with Gold scheme. Like oft before, November 2015 sees some co-op games in the mix; the yet to be released Knight Squad and, the not so new, Dungeon Siege 3. 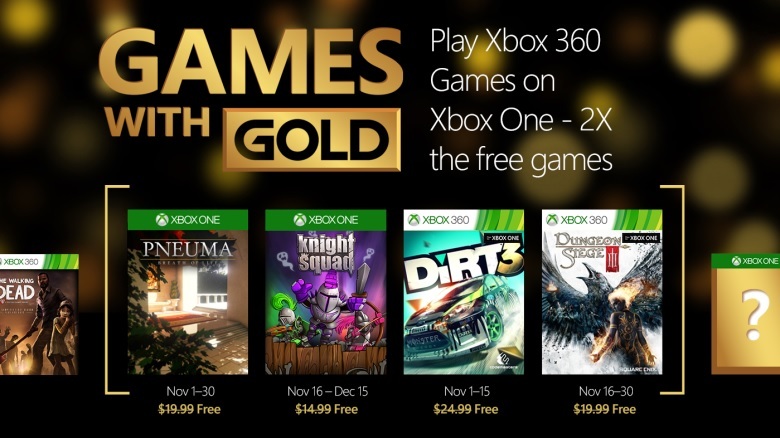 As per usual, Games with Gold is split across the month and on both Xbox One and Xbox 360. One owners get two downloadable titles; Pneuma: Breath of Life throughout the month and the 8 player co-op Knight Squad between November 15th and December 16th. Knight Squad is a mash up of classic Gauntlet and Bomberman action as seen through the eyes of a programmer with ADD. Co-Optimus already gave you the lowdown on the game and it looks great fun. As the game is only launched on November 15th, Gold members are essentially getting a chance to have the game for free on launch. 360 owners need not lament too loudly as they also get a couple of games, one of which has co-op. Dirt 3 is a classic racer on the platform and is yours for free between November 1-15th, whilst the 2 player local, 4 player online, co-op title Dungeon Siege 3 is available from November 16-30th. Dungeon Siege 3 is a solid action RPG that is great to play solo, but has restrictions on movement if played in co-op - the more players, the more restrictive. It is certainly worth grabbing for $0, but why not check out the Co-Optimus review of the game to see what Nick thought of it? All the above are available for nothing, only for those with a Gold membership. Page created in 1.2063 seconds.